Aimee Wood Works - Pursuing Creative Dreams!! Last year I went to NDK in Colorado for the first time, and it has been my favorite convention so far. It had everything: stellar artist alley, a well run and fun cosplay contest, cool panels, and spectacular cosplays all around. It was here that I met Aimee Wood of Aimee Wood Works on Etsy and Facebook. Stunning. 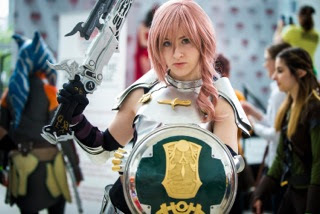 That is Aimee in one word and there are many to describe her talent and skills with woodcraft, prop making, and cosplay. She is also very inspiring: Aimee started an Etsy shop for her woodcraft props and items. After one year of running it she was able to quit her other full time job and make the Etsy shop her full time job. Aimee loves seeing the prop work in her living room and enjoys her career as a prop maker and woodcrafter very much. She has worked hard over the years to achieve her dreams, leaving behind a very different college degree for what she loves most. Her success is purely in her love of the craft and beautiful design and crafting skills. 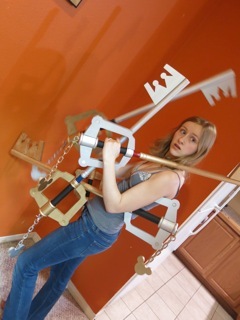 Aimee and her many Keyblades!! 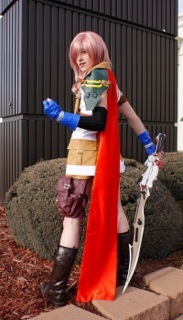 How long have you been cosplaying? What got you started in it? Ooh, first I must start with my gateway anime. Prince of Tennis and Pokemon the animated series, launched me into the... at once bizarre and yet wildly encouraging realm of anime. Naruto, Miyazaki/Studio Ghibli films, Ouran High School Host Club and others quickly bled into the classics of Cowboy Bebop, Samurai Champloo, and Evangelion. Soon after, I heard of a convention in my state, Nan Desu Kan, and in 2007, I experienced my first ever Anime Convention dressed as a cat girl. I was hooked- the atmosphere! Everyone was so passionate, caring, interesting- the people watching was the best I had ever experienced! I knew that the next convention I went to, I would have to join the ranks of those cosplayers who had so inspired me, and who were so nice to this overwhelmed, teenage cat girl. Now, walking around in cosplay, I get to be the one who welcomes newcomers into this zany hobby. I love meeting new people, answering their questions, supporting new cosplayers with compliments, encouragement, advice. In my experience, cosplay has been the most inclusive and cooperative community I have participated in- and with every interaction, I try to give back. 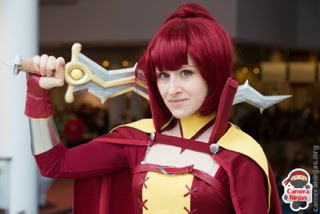 Aimee dressed as Anna from Fire Emblem. How did you choose your cosplay name? I spent a long time thinking about my 'cosplay name' before choosing it. I knew that I wanted to eventually sell props and do commission work- and I knew that many other cosplayers had negative experiences commissioning people. It seemed common for a cosplayer to pay someone for a prop, only for the person to disappear, not deliver on time, or deliver a poor product. In the end, I decided that I was going to use my real, full name. Aimee Wood is my 'cosplayer name', and Aimee Wood Works is my cosplay shop name. This way, if EVER someone orders something from me, and I don't deliver or I don't do a good job- they know exactly who I am, they know exactly where to find me, and I can be held accountable. I want anyone who buys a prop from me to feel secure in their purchase, and if ever they later need help touching up a prop, they know that they can contact me at any time. Before becoming a full time prop maker, what did you want to be when you grew up? Tell me about your degree more. When adults asked me, "What will you do when you grow up?" I had some standard answers that were interchangeable over the years. I'm going to be a high school science teacher. I'm going to be a nematologist. I'm going to work in a soil testing lab. I'm going to be a plant pathology field scientist. I was so concerned with coming up with an answer I would be proud to respond with, to have an answer that sounded like a future, one that would make me money. Shop on Etsy. My Parents are PROUD I'll have you know! While I was becoming a nematologist and plant pathologist in college, I worked in a soil testing lab, and I was good at it. I counted nematodes under a microscope for hours each day for a terribly hot, sweaty, Massachusetts Summer. I streamed bacteria, worked an autoclave, studied plant diagnostics, compiled a specimen database collected from over 100 hundred years ago. And I honestly hated every other minute of it. I love chemistry, I truthfully love nematodes, I adore science- but each semester I slipped an art class into my schedule. I couldn't imagine working in a lab after graduating. 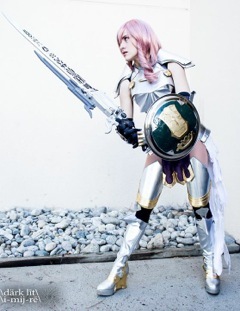 For one semester I spent every waking minute not spent in class working on cosplay armor. I immersed myself in anime, in video games, I went to conventions and admired people and costumes and our community. 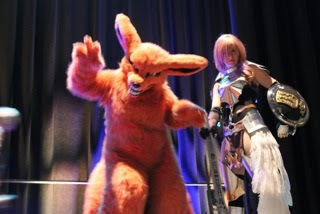 In high school, my best friend and I used to joke about one day traveling the world in cosplay, visiting conventions, making costumes and props. That was always my secret. That running joke was what I wanted more than anything else. But still I told people that I wanted to work in a lab, be a science teacher. My parents have always been supportive- but they would never have allowed me to go to college across the country to major in Art and Woodworking. I was always told, "Pursue your dreams!" but in our society, it's really, "Pursue a dream that will make you money!" 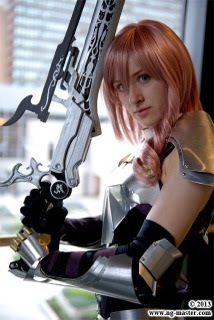 I wasn't taken seriously whenever I jokingly mentioned starting a cosplay prop business after graduating. "And why would I be taken seriously, if I didn't even take myself seriously? Last year, I finally decided to take my hobby, my passions seriously." Now, my parents brag about my successful business. Childhood friends, parent's friends, and old teachers (even my advanced portfolio art teacher), are always astonished that I'm, in essence, a successful artist. They quickly follow this up with- "Oh you were always so creative!" "I knew you would be doing something interesting! ", the bold ones ask me how much I make a month. Still they measure my 'success' in my ability to make money and not in doing something I love. I urge those reading this to take the advice I always ignored. Pursue your dreams. I worked a full time job in addition to running my shop for 9 months before being able to do this full time- I'm very lucky to have done that so quickly, and I likely wouldn't have taken the leap without my life mate's constant support. The change came as soon as I started taking myself seriously and scheduling myself to work, and I urge others- whether you want to be an artist, an independent film maker, a photographer, if you have a business idea- you need to take yourself seriously and act like it IS a full time job so that it can BECOME a full time job. metal armor, real feathers, and hand carving not one - but TWO - of the gun blades. What has been the biggest challenge in getting your Etsy shop started and working way to being a full time prop maker? Myself. My biggest obstacle was myself, my motivation, my doubts, my expectations. How do I even START an Etsy shop? How would I juggle making props and my job? I'd have to sacrifice my weekends, I wouldn't be able to enjoy anime and video games! Those things are why I'm passionate about prop-making in the first place, why would I sacrifice them? Most Etsy shops aren't even successful, why even try? I don't have the right equipment, I don't know how to do ____, my props aren't good enough to sell! I was basically a frightened wimp. I was a wimp that didn't want to put the effort in if I couldn't see the result at the end. I still go through bouts of doubt, fear that I quit my job too early, times where I can't seem to motivate myself and procrastinate on things. I think it gets easier over time, and you learn what works best to motivate yourself. I converse a lot with my buyers, and they truly help to inspire me. 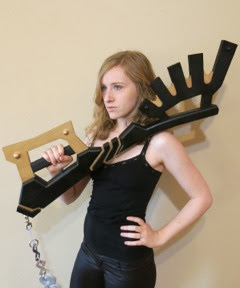 While I'm making a prop I think about who is going to receive it- this keyblade is a surprise gift to a spouse, this sword is going to be part of a child's halloween costume, this staff is the finishing touch on someone's cosplay. It gives me a surge of enthusiasm. Other times I think about how miserable I was working full time, how lucky I am to wake up to a living room full of various props. Anime Boston's Cosplay Death Match 2013. How long does it take on average for you to create and complete a prop? This varies wildly! The first time I make a prop, I probably spend 40+ hours (I underpay myself…). I test things out, I make prototypes, I redo things, adjust things. The more complicated the prop, the longer it takes me. BUT! After I've made it once, I can make it again in 1/5 of the time. The props I make more frequently I have almost an assembly line for, and so I make them in batches. 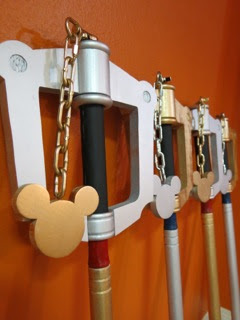 30 hours can yield a batch of 6 standard keyblades. Some times I act on whims… the Levin Sword was started on a whim, two days before Denver Comic Con. I patterned, created, detailed, and painted that thing from start to finish very quickly- the motivation was there and I put it to use. When I'm busier, I'm also more efficient- I've always been one that works well with a close deadline. So the answer is somewhere between 5 to 50+ hours. Your process for creating a new prop, what do you do from start to finish? 1. First step is to make it out of paper by patterning a life-size version of the prop. Easiest way to do this is to enlarge a screen shot, print it out, tape pieces of paper together, then cut it out. I do that, but then just use the dimensions to recreate it on newspaper paper. I make sure everything is symmetrical, angles are correct, I make more patterns of any designs or details, and then I transfer all of that onto bristol paper to make a 'Master' pattern for the prop. The whole time I'm doing this I'm thinking about HOW I'm going to do each piece, how to connect everything, what I'll need to purchase for the prop, if any detailing should be in clay/metal instead of wood. 2. After I fully cut out the master, I gather materials. Most everything I just make out of plank pine wood, and poplar dowels. Some parts I buy in bulk online (metal key hole screws, wooden rings, etc). Depending on the prop I may have to order special pieces as well, specifically colored gemstones, faux leather hand grips, steel studs, stuff like that. 3. Write a list of all the parts I need to create, and what I need to do to/with them. 4. 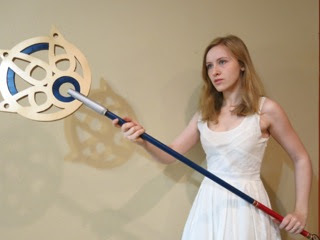 I use a scroll saw to cut out shapes; generally the large main shape of a gunblade, or the handles/teeth of a keyblade, the shaft and handle of a sword. 5. I use a router to bevel edges that need a specific shape. 6. I do any engraving/wood burning/hand carving that a piece might need. 7. Now I prep all of the pieces. This the part where I sand and sand and sand. I use wood filler where necessary (Sometimes the scroll saw doesn't give a clean a cut as I want). 9. I look over the prop, making sure everything is as planned. 10. Paint! I use spray paint on my props, and I HIGHLY RECOMMEND people looking up a tutorial on how to spray paint before doing so. You do it in many very light layers, quick sweeps, allow a minute or two to dry between layers then continue. If you put too much spray paint on a prop at once, it will cause puddles or drips that will dry and look weird. Really, light layers is the way to go. I always include a note with each prop that includes the paints I use in case a customer needs to touch up something later down the road. 11. Top coat!! This is important! It protects the paint from being scratched or chipped, and also helps make all of the colors look more uniform if you had to purchase colors from different brands. I use either gloss or matte depending on the prop (gloss for the face of a blade, matte for a gun handle). 12. Finishing touches- this is the part where I add in a faux leather handle, studs, gemstones, or anything else the prop might call for.